Modern Korean Cinema: Revenge Week: Vengeance Trilogy DVD/Blu-ray Giveaway! Revenge Week: Vengeance Trilogy DVD/Blu-ray Giveaway! Part of MKC's Revenge Week (July 8-14, 2013). 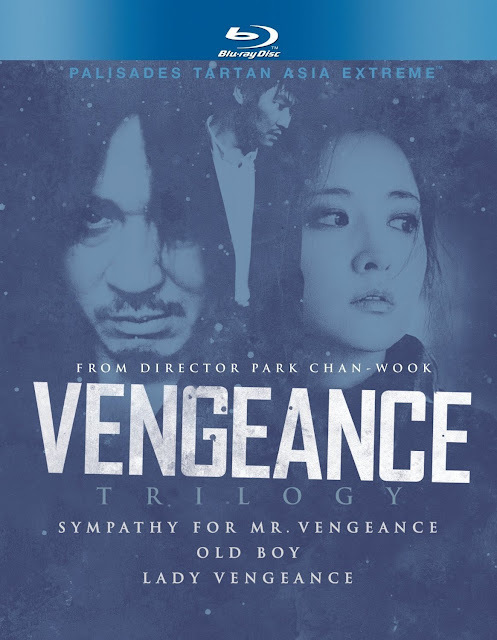 Just a few days left in Revenge Week now and the very kind people from Palisades Tartan have reached out to us to give a few lucky readers the chance to win Park Chan-wook's entire Vengeance Trilogy on DVD or Blu-Ray! It really needs no introduction but the set consists of Sympathy for Mr. Vengeance (2002), Oldboy (2003) and Lady Vengeance (2005), each bonafide classics of modern Korean cinema. Circling around the theme of revenge, Park's films, with their stunning mise-en-scene, macabre and original story lines and unforgettable performances, went a long towards redefining Korean cinema and letting the world know what it was capable of. To enter the competition, simply let us know what your five favorite Korean revenge films are. For a helping hand, please refer to our 'Revenge List', which currently features over 160 Korean revenge-themed titles. This competition is only open to North American and UK residents. We have three DVD sets and a pair of Blu-Ray collections to give away so please let us know your preferred format. You can either leave a comment here or e-mail us [email protected] This competition will run until Monday, 9am PCT, 12pm EST, 5pm GMT. Old Boy, Sympathy For Mr. Vengeance, I Saw The Devil, Yellow Sea, A Bittersweet Life. I would say A Dirty Carnival 5 times! lol But that wouldn't count. It's hard to pick just 5! My favorite revenge films are Mother, Memories of Murder, The Chaser, Lady Vengeance and Sympathy for Mr. Vengeance. Bedevilled, I Saw the Devil, Lady Vengeance, A Tale of Two Sisters, and Mother. It's really hard to pick! Anyway, for favorite revenge films, I'd go with Oldboy, I Saw the Devil, The Yellow Sea, Lady Vengeance, and Dirty Carnival. Hard to pick titles cause there are more that I like! (5)The Sword In The Moon .. I'm italian, so I can't compete... but no one mentioned NO MERCY.